What is the Pack Expo? Pack Expo International is the largest packaging and processing show and the only show you need to attend to find all your packaging solutions in one place! Join us this October in Chicago and you can find the full array of packing and processing innovations among 1,600 exhibitors and suppliers. Visit the Procon Pacific Booth E-8938 and learn more about our cutting edge bulk packaging technologies and our unique innovative sourcing and production strategy. 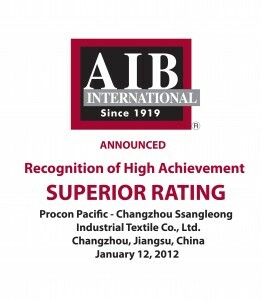 Procon Pacific has earned a “SUPERIOR” rating from AIB (the American Institute of Baking) for the third year in a row for our operation located in Changzhou, Jiangsu, China . Our rating became even more prestigious than before, as only those facilities whose score falls within the top 25% of all scores receive a Recognition of High Acheivement- Superior award. Procon continues to be the the only plant in mainland China to receive a SUPERIOR rating by the United States based AIB auditors.